This page lets you configure some administrative logging options. Note that this is different from diagnostics logging which is managed on the Diagnostics page. VPOP3 can send the administrator a daily usage report showing how many messages have been received & sent by the various users. This is enabled with the Send daily summary logs to <xxxx>. You can choose who the report goes to. If you choose Main Administrator the report goes to the user designated as the Main Administrator in the Admin Settings. The email you receive will have the subject "VPOP3 Daily usage Summary for <date>"
If the Show Idle Accounts in the Summary log option is checked, the usage report will show accounts which haven't been logged into for at least a day. If the Generate HTML format summary messages option is checked, the usage report will be sent in HTML format as well as plain text. The format is still the same, but it uses HTML to indicate that the font should be fixed-width and so on, which helps with formatting in some email clients which display plain text messages in a variable-width font. The Keep raw Summary log files in the SUMMARIES directory option tells VPOP3 to copy the raw data which is used to generate the report in the SUMMARIES directory inside the VPOP3 directory, otherwise it is deleted after the report is generated. This raw data may be useful if you wish to perform your own analysis - the file format is described here. As well as the daily summary log, VPOP3 keeps a MAIL.LOG file which contains more information about sent/received messages. This is renamed daily to MAILLOG.MON, MAILLOG.TUE etc up to MAILLOG.SUN, then, the next week these files are overwritten. If the Keep MAIL.LOG files in the SUMMARIES directory option is checked, then VPOP3 will copy these files into the SUMMARIES directory as well. VPOP3 logs all failed login attempts to a log file called SECURITY.LOG in the VPOP3 logging directory. This can be useful for diagnosing login problems because it contains more details of why a login failed than the normal login response does. The login response is a generic "Login Failed" to avoid helping an attacker, but the SECURITY.LOG file will indicate whether the problem was with the password, or permissions or IP access restrictions etc. If the Security Log contains Successful Logons box is checked, then the SECURITY.LOG file will also show successful logins. VPOP3 writes a brief summary of connections to a file called CONNECT.LOG (eg time online, how many messages were downloaded etc). If Write all status window messages to CONNECT.LOG is checked, then all data displayed on the Status Monitor activity log or the Server Status page will also be written to the CONNECT.LOG file. 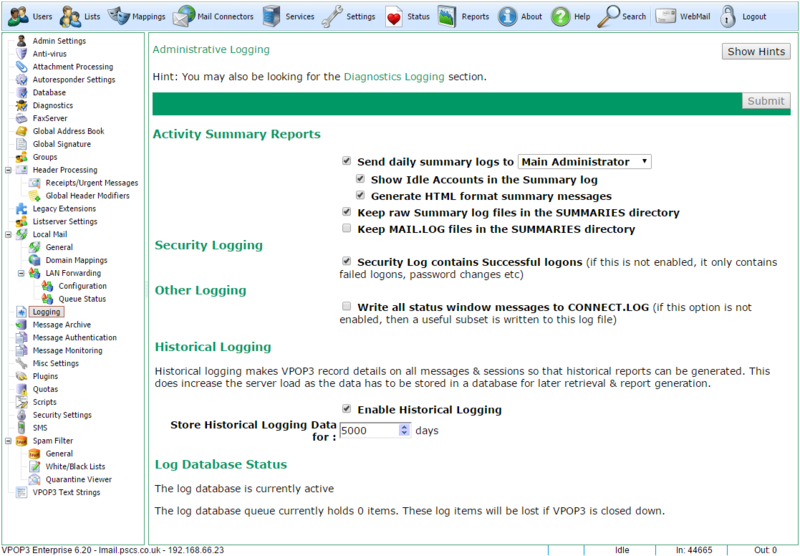 The Historical Logging option in VPOP3 makes VPOP3 write a summary of all messages and sessions to a database table. This can then be used for some reports. However, this logging does add load to the server and take up disk space, so it is optional. The Enable Historical Logging option turns this facility on or off. The Store Historical Logging Data for x days option tells VPOP3 how many days it should keep the data for. Obviously the larger this setting is, the more disk space will be used. The Log Database Status section shows whether the Historical Logging database is active and how many entries are waiting to be written to the database. (Writing to the database is a low priority background task).